Making the trek to Normandy, France has always been a dream of mine. My father served in the US Air Force for 32 years and my husband has served for 16 years. 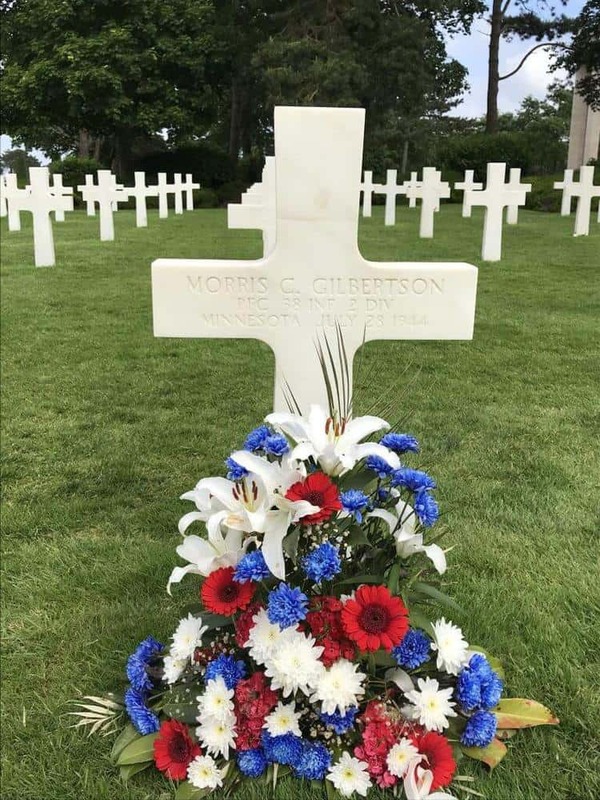 We were lucky enough to be able to attend during the 2018 D-day anniversary celebration. Check out the event page HERE. Since we were living in Southern, Germany, it made sense to go ahead and drive the 10 hours to Saint Mere Eglise. We stopped 1/2 way on the way in but drove straight through on the way out (9-hour drive). On the way in, we stopped by Rouen, check out that post here. We also took a day trip to Mont Saint Michel, don’t miss our complete guide on how to visit the beautiful abbey with kids. If you are flying from the states, it would be easy to fly into Paris and then rent a car to finish the 3-4 hour drive to St. Mere Eglise. 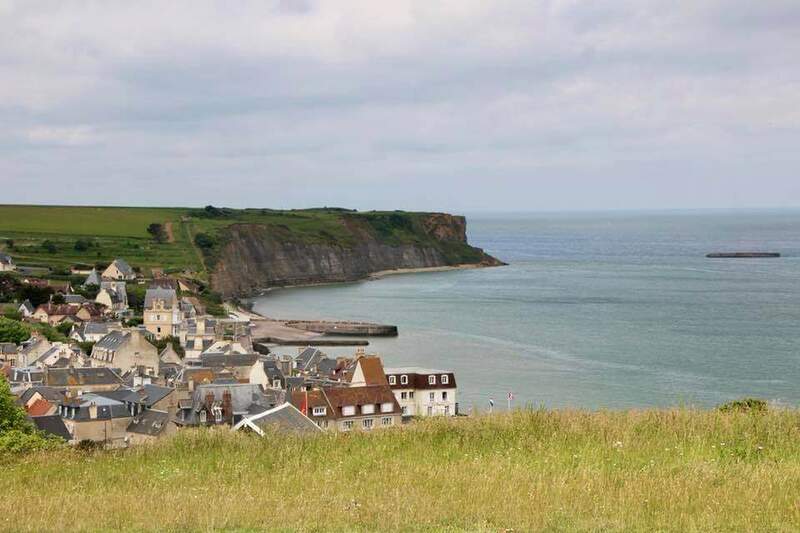 You could base yourself somewhere in the nearby area to explore the d-day sights from there. Due to traveling for my husbands work and inviting friends and family to come to visit, we rented a four-bedroom house in Orglandes. If you are doing a group trip or you have a large family, this house was amazing! Huge kitchen, living room with wood fireplace. Two bedrooms on the 2nd floor and another two bedrooms on the 3rd floor. There was also a games room adjacent to the house. Lots of space for entertaining and relaxing. Here is the link to the airbnb HERE. If you haven’t booked a trip with Airbnb yet, click this link and we will both be given a discount on our next stay! 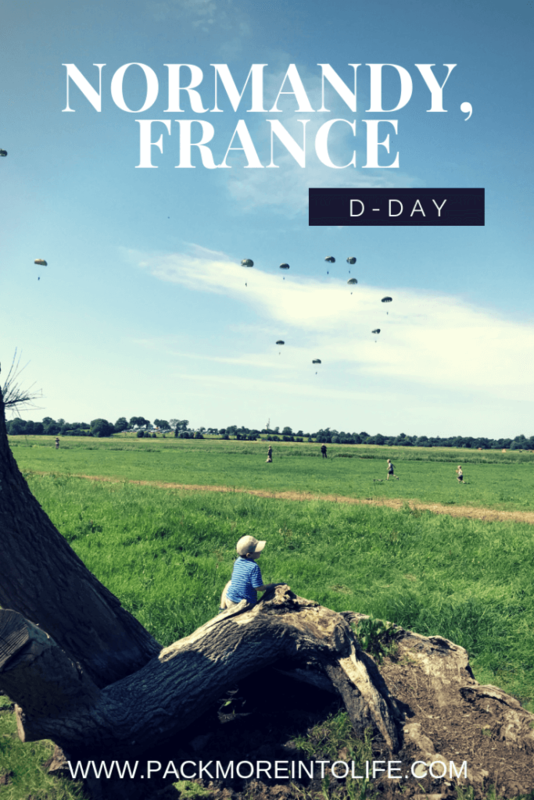 This guide will include insider information about where to go to enjoy the D-day events and which events are worth your time. My husband was working in Germany and selected to run the freefall portion of the d-day reenactments. It will also feature how to make Normandy as kid friendly as possible. Even if you aren’t able to visit during the anniversary celebrations, there is plenty to do in the area. If you only have one day to explore the D-day sights, you’ll have to either be quick or minimize how many sites you see. We were in the area for 6 full days, but it would be doable in 2-3 full days (including a trip to Mont Saint Michel). This trip was a bit unordinary since we were working around my husbands schedule with coordinating the D-Day events. However, Rick Steves has always been helpful in any European vacations we have planned and with his Normandy focused travel book, it was indispensable in bringing the D-day events to life. You can check out his guide here. 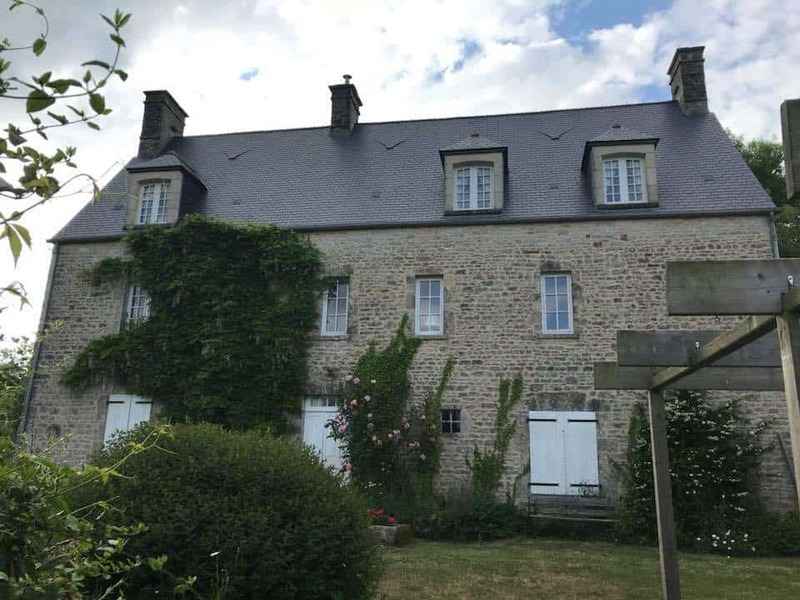 If you are planning Normandy as one of your first trips, or even if you are a pro, I’ve written up some great tips on how we plan our travels and how we pick a place to stay. Both might be worth a read. Traveling with kids always requires a bit of extra gear. Traveling in the summer did lighten our load a bit because we didn’t need all the winter gear. For this trip, we traveled with a foldable wagon. Since we lived in Germany, we purchased a FUXTEC wagon with sunshade. If you are a US-based reader, here is a great alternative from Amazon, a foldable wagon with canopy. We have a bag (actually used for storing comforters below the bed) and it folds up inside. We pad the wagon with an extra blanket and a bungee cord. Since most airlines allow a stroller to travel for free, we just check it as our “stroller” and off it goes. It is a great alternative for older kids who have outgrown a stroller but still need to rest their legs. We also brought a toddler carrier. Our son was a bit older, but we knew some of the longer days would require a break. The carrier gives us the flexibility to just wear it around our waist and then toss him into the carrier when he needs it. We are fans of kinderpack carriers and Tula’s, but you can also grab a toddler carrier on Amazon. Not sure how to pack all this gear? Head to my “Packing Tidbits” section. Lots of great ideas on maximizing your limited luggage. For our first day, we headed out from our Airbnb towards Arromanches. It is one of the farthest points away from our Airbnb, so the plan was to head out and then work our way back in. 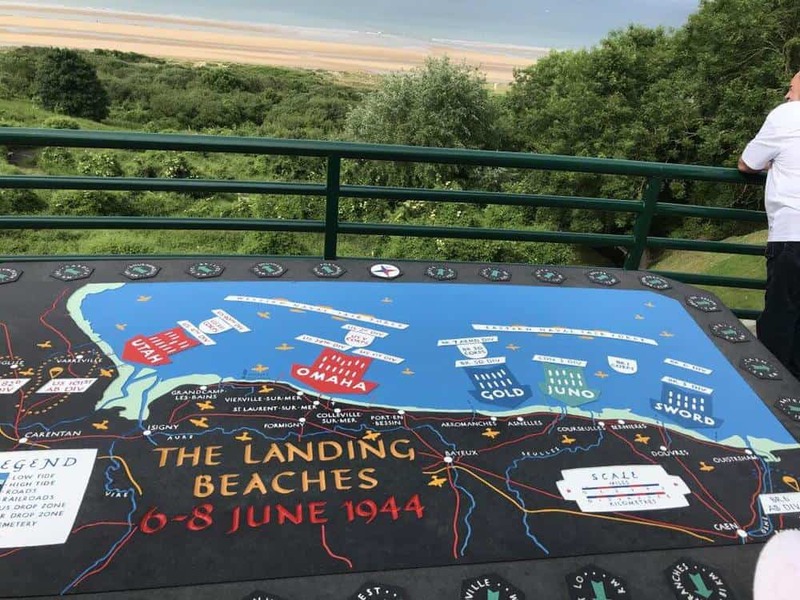 Arromanches 360 was a perfect starting point with its 20-minute video that gives a brief history of the D-day landings. They do advise that it may not be appropriate for smaller children due to the loud noises and content. We sat near the exits with our group in case the kids got scared (age 2 and 3), but neither had any trouble. Once you finish with the theater, you can explore the clifftop and then head down to the D-day Landing Museum. This museum shows how they built Port Winston Artificial Harbor in a matter of 12 days. It was a lifeline for the troops already on the beach to receive much-needed supplies and gear. Instead of checking out the museum, we let the kids check out all the gun batteries along the harbor before grabbing lunch. We really enjoyed our lunch at Brasserie d’en face. They have a nice courtyard area in the back, which was perfect for our large group with kids. Next, we jumped into the car and headed over to Longues-sur Mer gun battery and observation bunker. This was a favorite. It features four German casemates (3 with guns intact), the only original artillery guns remaining which were staffed by 194 German soldiers, and could hit targets up to 12 miles away. It took 7 soldiers to operate each gun. Lots of space for the kids to run and they are able to climb in and around the gun batteries. You can also head down closer to the coast to view an observation post. Strollers are doable here with paved paths, but we decided to let the kids get some exercise and had carriers for when their little legs got tired. Bring snacks, I don’t remember many food options around. Next, we drove down the road to the American Cemetery & Museum overlooking Omaha. The museum portion is the only area that requires you to go through security. There was a bit of a line, but it was worth waiting in the security line. It’s American security, so expect a metal detector, bag scanner, and a slow process. Once inside, we really enjoyed the various films, the wall that showed the chronological dates and events of the D-day landings and the personal stories before you reach the exit. It really brought the soldiers stories to light and helped bring brevity to our visit to the cemetery. We looked at the views from the bluff down to Omaha beach. There was an informative map showing the various D-day landings. Then we followed the path towards the cemetery and graves. The American Cemetary reminds us of our visit to Arlington National Cemetary. 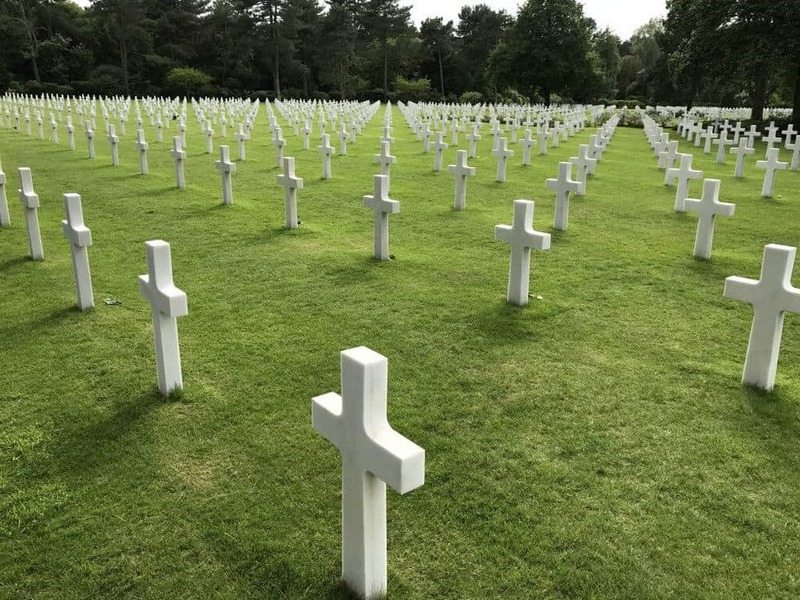 The simple white crosses of over 9,000 men and woman who perished during WWII during D-day and ensuing military operations. This is where we ended the first day. After a somber visit to the American Cemetary, we headed back to the Airbnb for a nice dinner and went into Saint Mere Eglise to check out their encampment (more about that later). If you are traveling with older children or no children, continue on! This would be the perfect time to head down to Omaha Beach to explore. We visited later in our trip, so check out the details below. We started the day heading out to Pointe Du Hoc. The Germans most heavily fortified position where you can still see evidence of huge craters from bombs that were dropped by the allied force. Pointe-du-Hoc got hit by more than ten kilotons of high explosives, the equivalent of the explosive power of the atomic bomb used at Hiroshima. 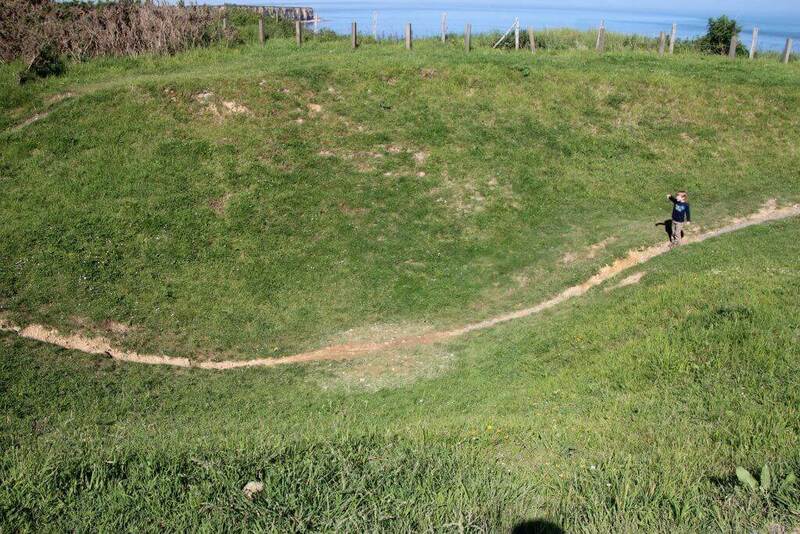 Pointe Du Hoc was intensely bombed from April until June. It was bombed in advance of 225 handpicked rangers who used rocket-propelled grappling hooks connected to 150-foot ropes to climb the cliff. Out of the 225 that made the attempt only 60 survived. We spent at least 1.5-2 hours here. 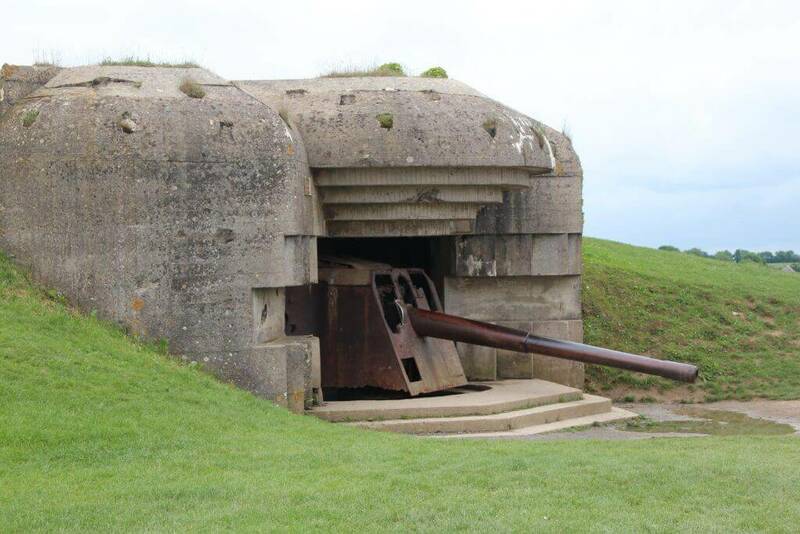 There were bunkers to explore, craters to run up and down and airplanes from the D-day events to watch overhead. You can see my 3-year-old son and realize the true depth of this bomb crater. You’ll need a carrier for this portion of the trip. It is all grassy paths with bunkers in a variety of states from “complete” to “bombed out”. Beautiful views from the cliffs. My husband said that this was his favorite location to visit. The combination of bunkers, bomb craters, and cliffs really brought to light the difficulties that faced the Allies battling back the Nazi’s. It was mindblowing to walk into the bunkers and hear the private guides discuss the operation and the thoughts from the Germans inside the bunkers defending this position. We would have loved to have hired a private guide to really bring this area to life. I had to do quite a bit of research and keep my Rick Steves Normandy guide close at hand to piece everything together. It was a short 35-minute drive to our next location, Utah Beach. There is a small restaurant to grab food, so we choose that option. We also brought some beach items and a blanket to picnic on the beach. 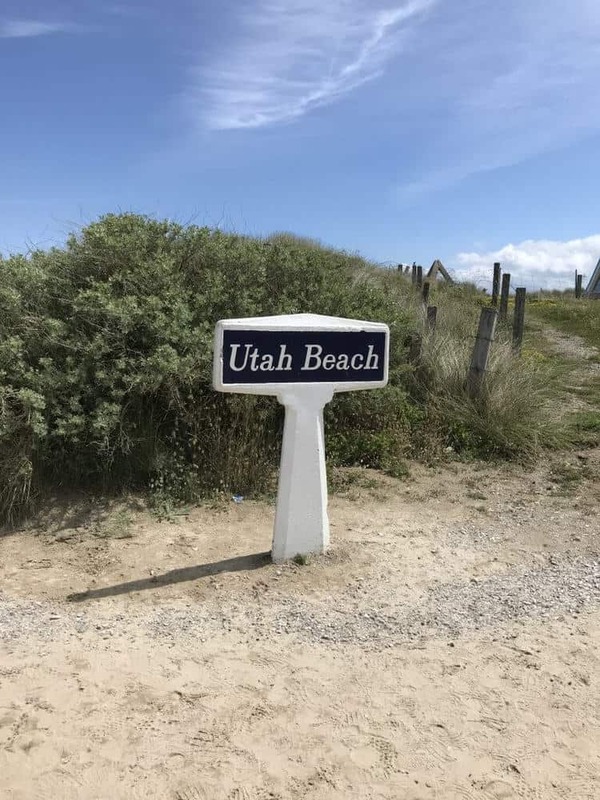 The citizens of the Normandy region have done an incredible job in keeping Utah and Omaha as realistic as the day the beaches were raided. Some of the other allied beaches have turned into seaside towns. Visiting Utah beach is best at low tide. 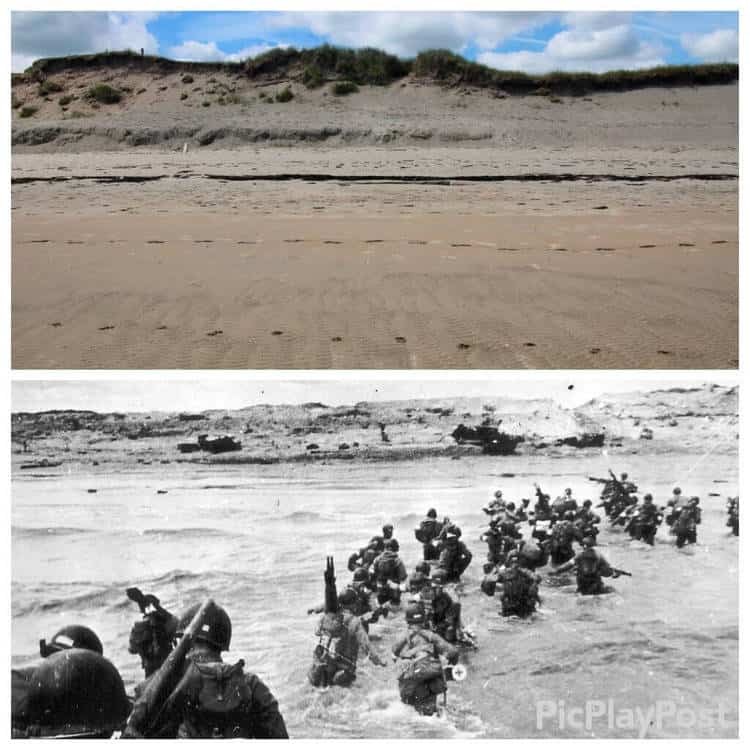 That is when the troops stormed the beach in order to avoid the protruding metal and defenses meant to deter a beach landing. It will give you the best perspective. If this is your second full day, I would head into Sainte-Mère-Église to see the first town liberated by the Americans. Or view my list below of other sites to visit. 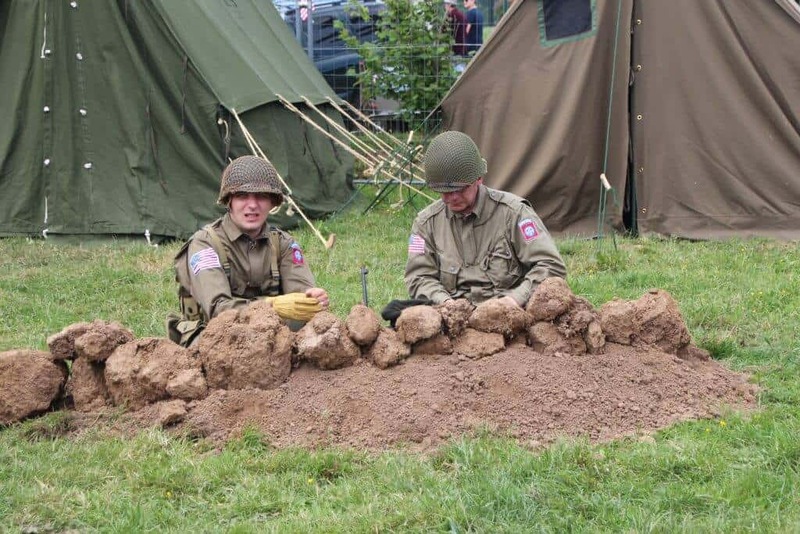 The evenings are full of events during the D-day anniversary celebrations. Such as a concert near the sea ” Foucarville Bunker” with Jipé Jazz Gang in 2018. Since we checked off the majority of the D-day sites, we focused on the events! Sainte Mère Eglise is where we spent the majority of our time. 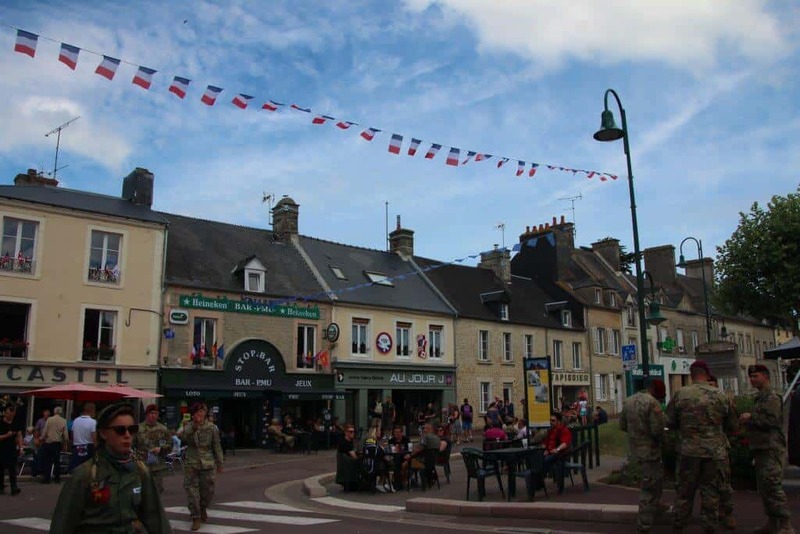 It was the first town liberated by the Americans and the central point for the D-day festivities. You’ll see the famous church where John Steele landed on the roof (and they have a dummy still hanging there), as well as entertainment. 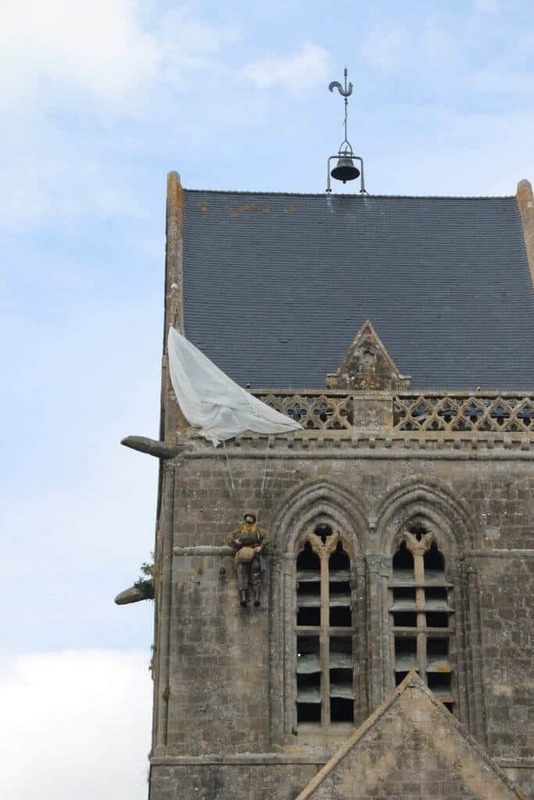 John Steele (dummy) hanging from the church steeple where he landed on D-day in St. Mere Eglise. He survived the war. In 2018 they had live music, parades, food tents, a military camp complete with vehicles (a highlight for my son) and a fair type area with rides/bounce house/fair food. We also enjoyed watching the special parachute drops on the church square. We did visit the “Geronimo” reconstruction camp. We were even lucky enough to catch the vehicles heading out to prepare for the parade. Imagine WWII tanks driving just feet away!! Open from 9h to 22h every day. Camp featuring US airborne troops in Normandy, with the participation of Overlord 76, Eagles Brawlers, V for Victory and MVCG Britain, Eure Liberty 44. 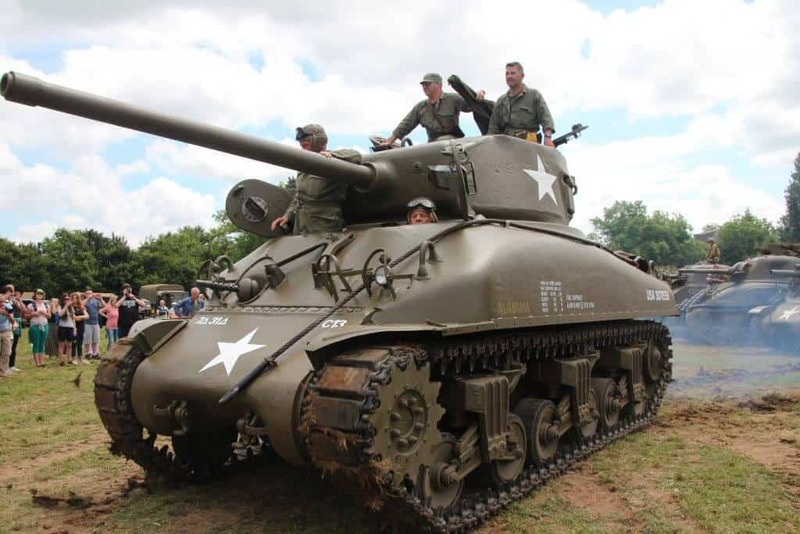 Huge model camp from WWII complete with tanks, vehicles, re-enactors, and tents. Want to see the tanks in action? It was incredible! Check out the D-day events page for a list of events. The atmosphere is amazing and honestly not as crowded as I expect. We were able to find a spot to watch the parade, grab food and not wait in too many lines. So don’t let the events dissuade you from coming. Enjoying the festivities in St. Mere Eglise for the D-day celebrations. We ended the day in Sainte Mère Eglise with fireworks! Day Three: D-Day Jump Day! 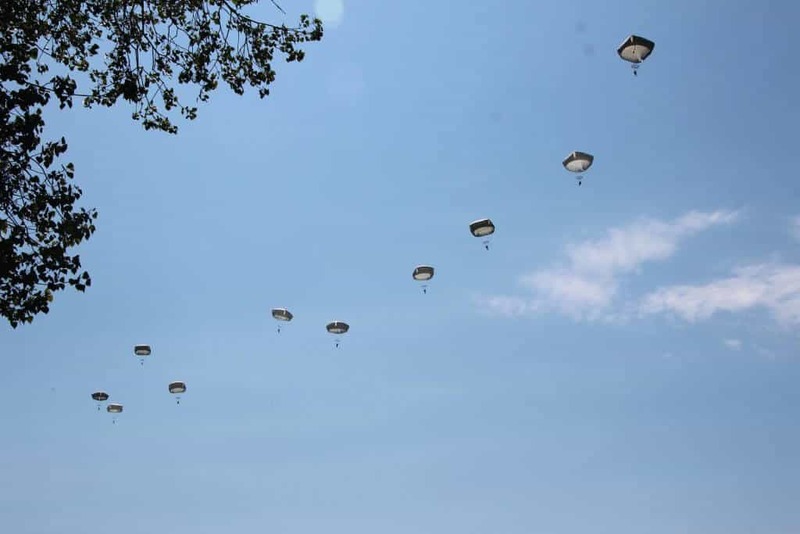 Every year, thousands of static line and freefall jumpers jump just outside Sainte Mère Eglise at the Iron Mike drop zone. See the location HERE. On the day of the event, you’ll see various parking areas (also expect a lot of roads to be closed). You can also walk from Sainte Mère Eglise, but it’s a bit of a hike. Parking was easy if you show up around 10 am. Bring a picnic blanket and toys to keep the kids busy. Also, cash for the food and drink vendors. See a satellite google map image below. The yellow zone is “general viewing”, the white is a bridge that crosses over to the VIP area. The blue zone is where the VIP tent is set up for veterans and the press. The landing zone is South and West of the red circle. There are food and drink tents set up. Bring a blanket or chairs. If you get there early, you can walk pretty easily across the white bridge and lay a bblanket near the tent. You can buy food in the VIP area as well. The static line jumpers start around 11 am (weather dependent). You’ll see multiple planes make pass after pass dropping the jumpers. The best location for viewing is just down from the white bridge by the rope. This will put you close to the food, but prepare for crowds. We were located in the VIP area, which was truly amazing. Many of the WWII D-day survivors and their families attend this event every year. There is something special about meeting someone who was there on June 6th, 1944. 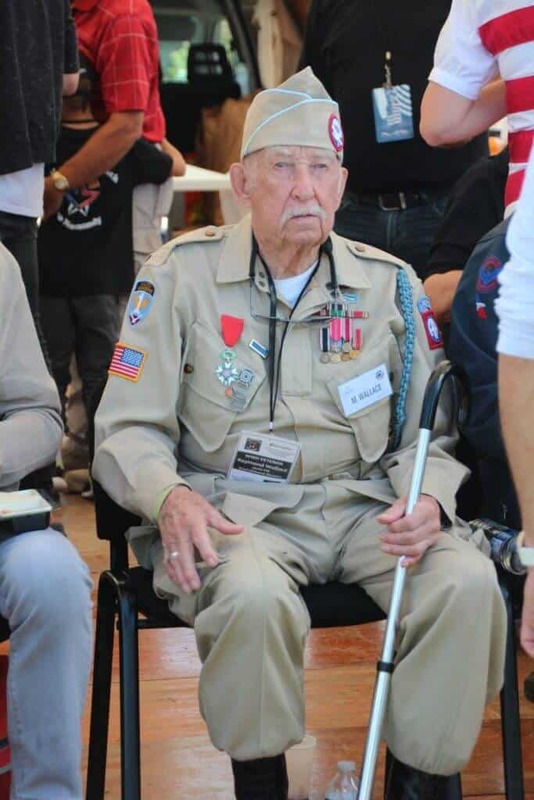 Wallace was a paratrooper in the U.S. Army’s 82nd Airborne Division and was among those who parachuted into Normandy, France, on June 6, 1944 – D-Day. After the static line jumpers, the freefall jumpers will start (typically around 2 pm). We enjoyed watching the freefall jumpers because they would aim to land right in front of the VIP tent. It was incredible to watch how well they were able to land in a crowd of people. The spectators are able to freely roam around the majority of the jump zone. Want to see what it is like to be at the jump zone? Check out the video below. 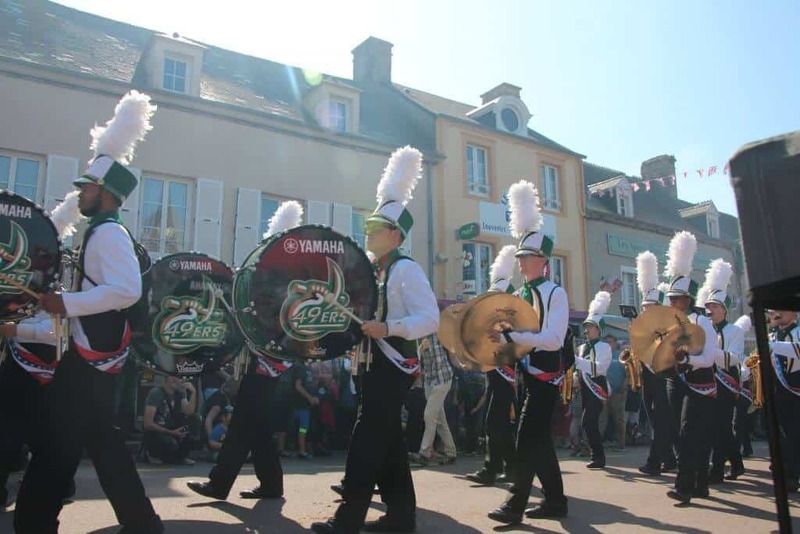 Then we headed back into Sainte Mère Eglise for a huge party and another parade. The festivities were lively! All of the soldiers who took part in the parachuting walk into the town. 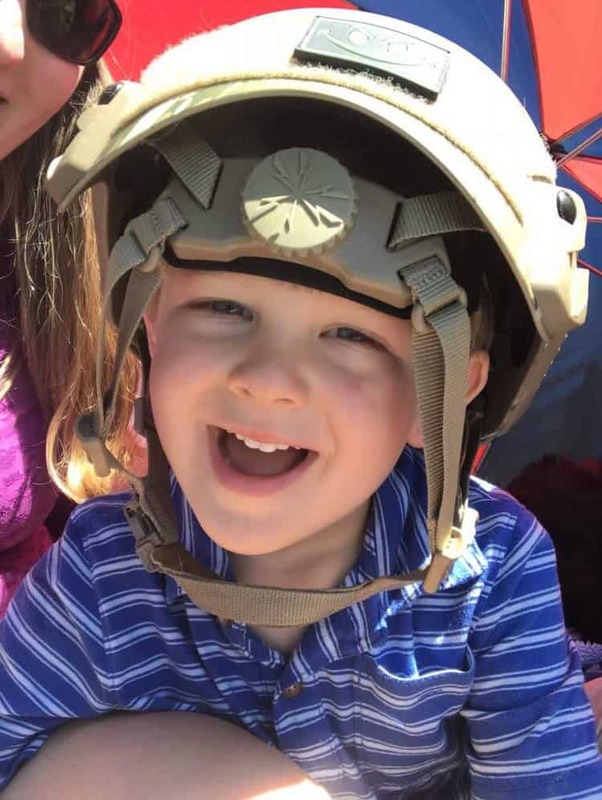 Insider tip: If you have kids, have them ask the soldiers for a patch. It’s a fun way to encourage the kids to take part in the events and they will love their custom souvenirs. If they are older, see how many different patches they can gather. The kids will have more luck with a polite request. Visiting Normandy during the D-day events was truly amazing. The atmosphere, the history, and the reenactors made the whole area come to life. 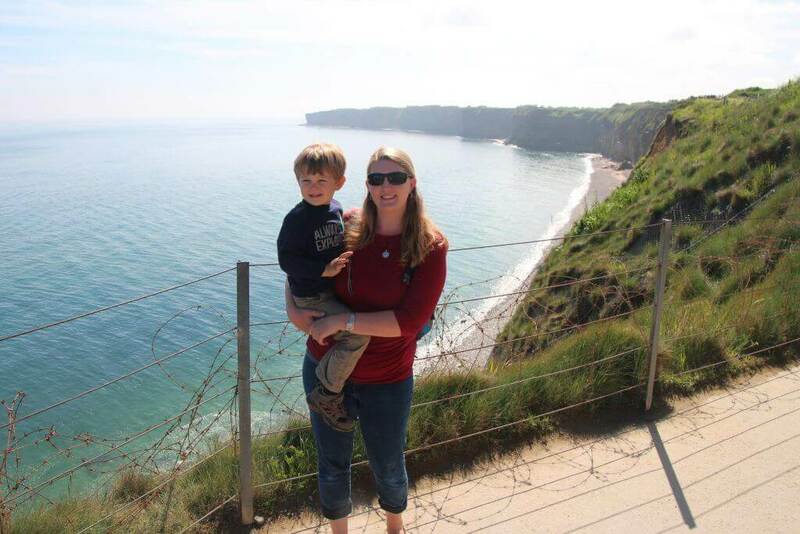 It was easy to travel through Normandy with kids due to the outdoor sites and laid back towns. Restaurants were happy to cater to us with kids meals and the whole area is extremely American friendly! There are American flags flying all over. This area of France is mostly stroller friendly. 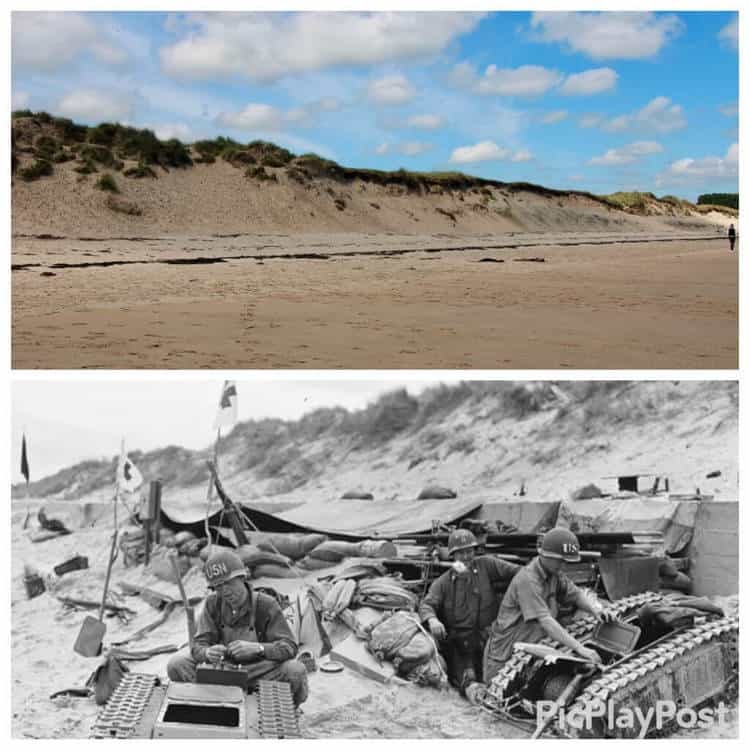 Bring a carrier for Pont Du Hoc and for the beaches. We traveled with a foldable wagon it worked well for the majority of our trip. There are grocery stores for any of your baby needs. Carrefour was a favorite for us. The Airborne Museum in Sainte Mère Eglise is also a great place to visit. We didn’t have a chance with all the events, but it was recommended to us. D-Day experience: just behind the Dead Man’s Corner Museum: enter briefing room, climb into authentic Douglas C-47 bomber, buckle in and do a simulation, crash land. If you’ve enjoyed this guide to Normandy with Kids, check out some of the other destinations here! Great write up and extremely informative. I have conducted several battlefield Tours to Normandy over the years and I found your write up to be the most exceptional. Look forward to reading more from you. Thank you so much! 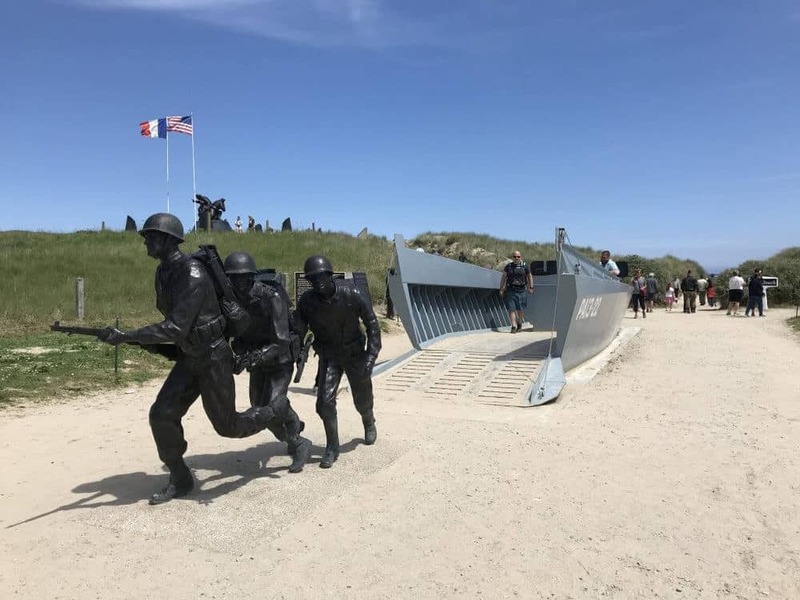 It was such a wonderful experience for the whole family to be able to visit the D-day sites and get an understanding of what the hardships the Allies faced. Just so you know, the plane in the photo with the caption about WWII-era planes is a Lockheed-Martin C-130J Super Hercules, which started being manufactured in 1996, not during or before WWII. Also, a 10 kiloton bomb would be a nuclear device almost as powerful as “Little Boy” (13-15 kT), which was detonated over Hiroshima on August 6, 1945. The ordnance used on Pointe-du-Hoc were standard 500-pound or 1,000-pound high explosive bombs. Yeah, there are unfortunately very few WWII-era planes left that are airworthy, and most of them are fighter planes. Bombers are very expensive to restore and maintain, but there are a few around. 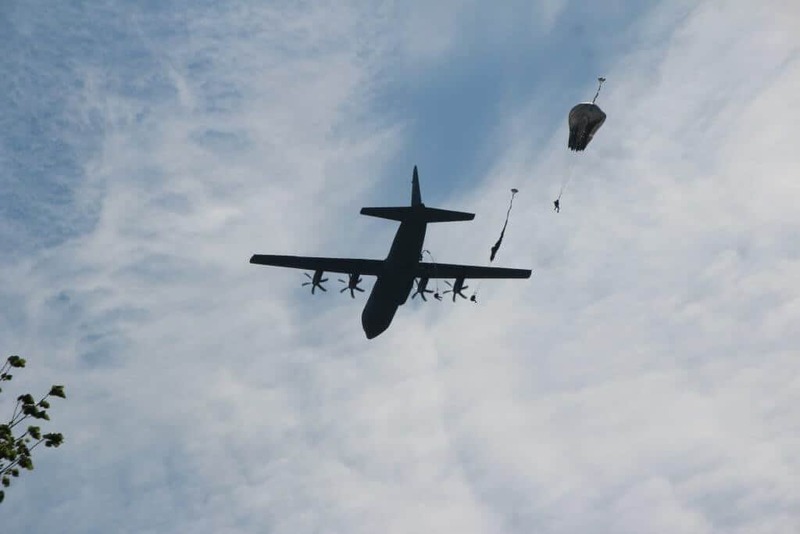 The C-130 in the photo is a transport for moving equipment and men, including paratroopers. Its WWII counterpart is the twin-engine Douglas C-47 Skytrain, which is a DC-3 in civilian life. Unlike the C-130, the C-47 was not used to transport equipment. It’s what the American paratroopers jumped out of on D-Day. 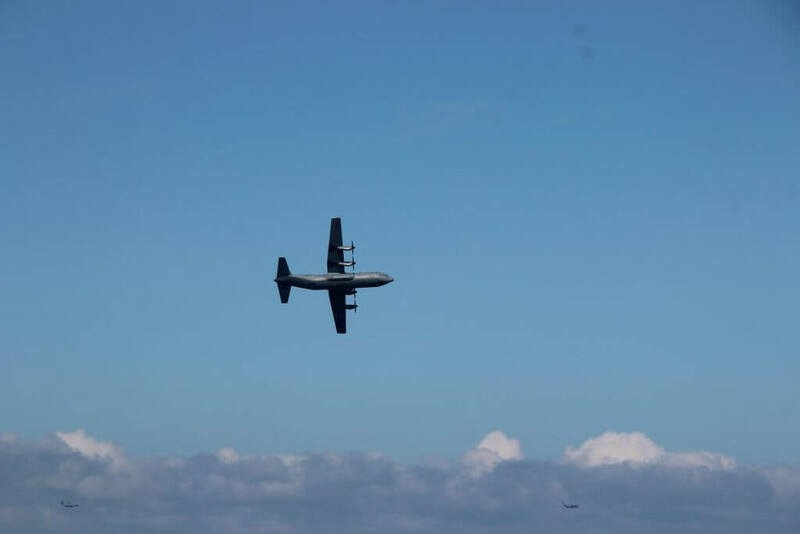 The C-130 is much safer for paratroopers because the rear of the plane’s belly opens, as opposed to requiring the troops to exit the side of the fuselage and get hit by the prop blast. 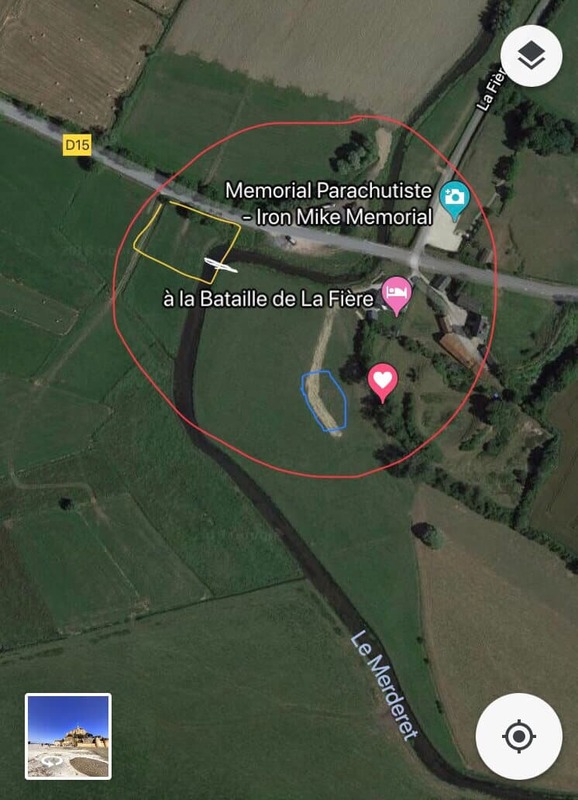 The location of the paratrooper landings at the D-Day commemoration in Sainte-Mère-Église was useful. 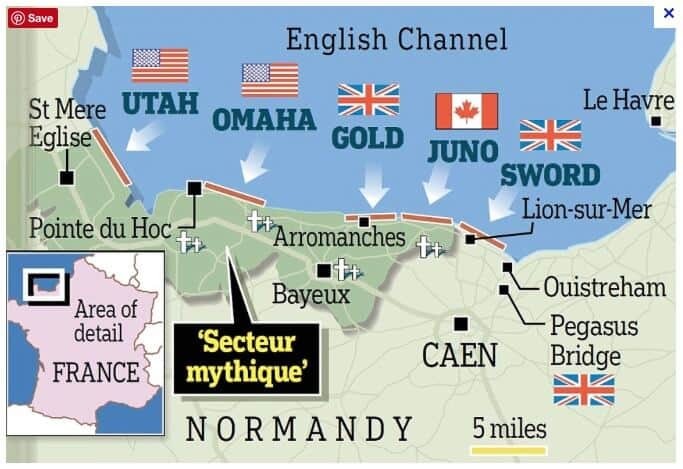 I was in Normandy with my family in late June six years ago, but I’m going back next year with two buddies for the 75th anniversary of D-Day, so it will help to know where to look. So glad you found the post helpful! We really enjoyed the trip.